Relish some of the most exotic succulent preparation of Goan, Indian and the Far East. Welcome to The OLD TAVERN and enjoy an elegant and authentic dinning experience of a Goan – Portuguese Fusion restaurant, where guest can dine in or out in the evening around pool side deck. The soft candle lit atmosphere serves as the perfect setting for a tantalizing menu of Goan, Indian cuisine from around the region, blending tradition with the contemporary. 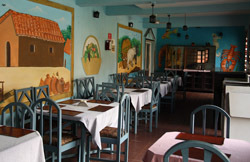 The interior is recreated to match the Goan Portuguese Tavern with local artist painting adorning the walls. The restaurant is open from 7.00 am – 10.00 am for breakfast, 12.00 pm to 2.30 pm for lunch and from 7.15 pm to 10.30 pm for Dinner. Enjoy the experience during your stay at Maria Rosa Resort.